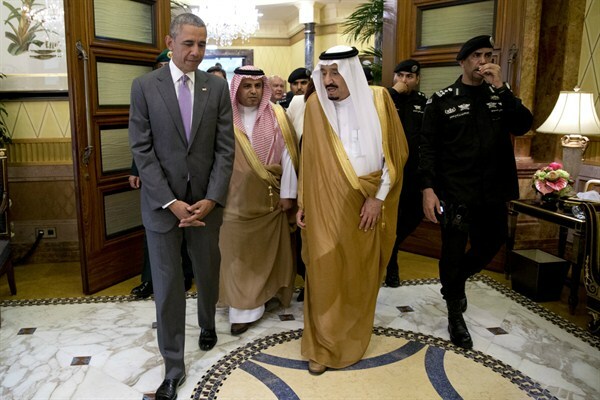 U.S. President Barack Obama and Saudi King Salman at Erga Palace, Riyadh, April 20, 2016 (AP photo by Carolyn Kaster). President Barack Obama has often been more upfront than past American presidents on what he thinks about the nature of ties with Saudi Arabia. Years before he came into office, he referred to Riyadh as one of America’s “so-called allies” in the Middle East. Last year, when asked by Australian Prime Minister Malcolm Turnbull if the Saudis were America’s friends, Obama reportedly replied, “It’s complicated.” And he does little to hide his frustrations with the kingdom, whether over its export of Wahhabism around the world or its treatment of women at home, in interviews, as was the case with The Atlantic’s Jeffrey Goldberg earlier this year—the source of that comment to Turnbull—or in remarks attributed to members of his administration.